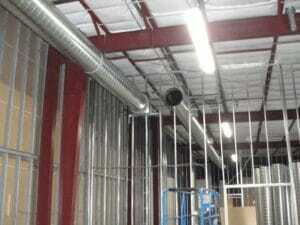 Commercial Remodeling Project | ALL, Inc. | St Paul Minn.
Project Update ALL Inc’s Showroom for retail clients. We covered some information about ALL Inc.’s commercial remodeling project in a previous post, but we wanted to share an update with you. It is still a work in progress, so you’ll have to check back for the finished product. ALL Inc. is a distributor of cabinets, countertops, and appliances serving the Midwest. They work with companies in the remodeling and construction industries as well as retail clients. A high-quality showroom in this line of work is a must. Potential clients come to the showroom to preview products and get information. The project is going to take the existing showroom and kick it up a notch. ALL Inc. has many clients in their showroom on a regular basis, so it is important that the showroom is appealing and has all the necessary equipment. In the beginning of the project, we framed up new walls, including sheetrock and painting. These new walls will make the room’s layout newer and more fluid. We are adding a new electrical system for the refrigerator showroom displays. This upgraded electrical system will help ALL Inc. be more energy efficient, as they have many appliances running at one time. The Titus Contracting team installed a new HVAC system consisting of new spiral duct work running through the open ceiling area. It will help the showroom be comfortable all year long. By the time the project is complete, the ceiling will be sprayed black and then we will be hanging new tracking lights for the showroom. ALL Inc. will be able to use this lighting to feature specific products. As part of the project, we are remodeling an existing bathroom to make the new fixtures, tile, countertop and lights ADA-compliant. This project isn’t finished yet! Please stop back to see the finished product and other St Paul commercial remodeling projects. If you want to do a commercial remodeling project at your facility, contact us today by calling 752-746-7817 or Request a Free Estimate.